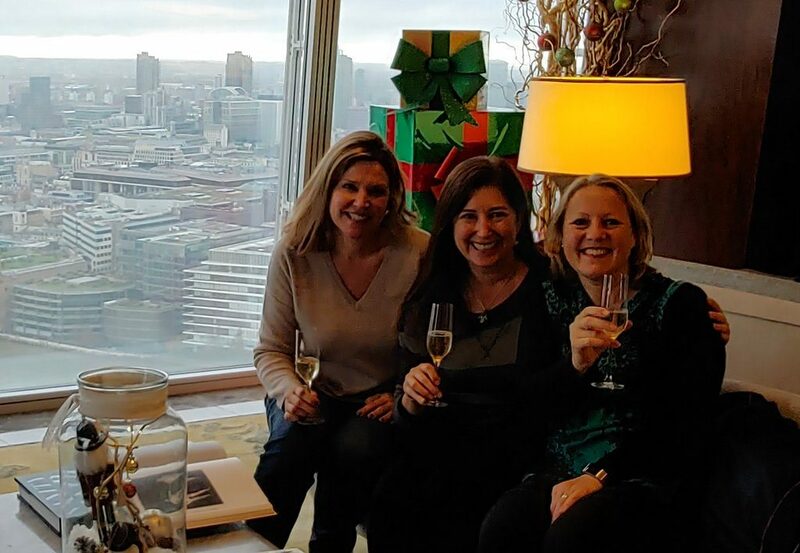 Thank you to Julie and Nancy, my dive and travel buddies from Princess Cruises, for joining me in London at Shangri-La Hotel, At the Shard. See the first part of our journey here. Video: What to do near Shangri-La Hotel, At the Shard, London? and the Modern Couples Exhibit at the Barbican Museum. Shangri-La Hotel, At the Shard, London even had a special map for us with points of interest on our walk to the Barbican. Borough Market was fully decorated for the Christmas holidays during our trip Dec 1-3, 2018. Nancy Lisa and Julie on Millennium bridge in London. Make sure to stop for a photo at the wall of hearts and love! At Tate Modern, I saw an exhibit of Jenny Holzer’s work which I had recently seen at the new Comcast Tower in Philadelphia. We lunched around the corner from the museum at The Coriander. Spending time with Julie and Nancy was special to me because I worked with both of them onboard Princess Cruises. I feel fortunate to have fantastic supportive friends like them who are willing to travel with me. Nancy, Julie and Lisa at lunch in London! As we walked back, we wandered through St. Paul’s Churchyard and walked across the Millennium Footbridge. At night, we walked across Tower Bridge and enjoyed the views of Tower Bridge from our stunning hotel. We loved the views from Shangri-La Hotel, At the Shard, London. See more in the next video all about the property with my gorgeous suite, the highest sky pool in all of Western Europe and GONG the Sky Bar. Have you always wanted to stay in a sky hotel? Visit Shangri-La Hotel, At the Shard, London with me. Video: Have You Always Wanted To Stay In A Sky Hotel? The rooms are stunning and the view is beautiful. I loved watching the ships in the water go under Tower Bridge. Julie and I loved the view so much we had a picnic in our room in our robes. Pick your robe: a white terry cloth robe or a Japanese yukata robe. I wore a yukata to the 52nd floor to visit the Sky Pool, GONG the sky bar and work out at the fitness center with a view.. This is the highest pool in Western Europe! We ate breakfast at TING and tried almost all the choices on the buffet. There are Asian, English and American specialities! Click here for more info about Shangri-La Hotel, At the Shard, London. Read about our adventures in London PART ONE and click here for all of our London videos. After London, I flew to France for my first ILTM conference in Cannes.